The Hot Dog I Ate…Or Was It? When given the choice between crab stuffed crab and hot dogs, the wife of a hot dog blogger does not, as most of you out there in cyber-space believe, choose to eat the hot dog. I did find, however, that I could have the best of both worlds. Why not eat both? 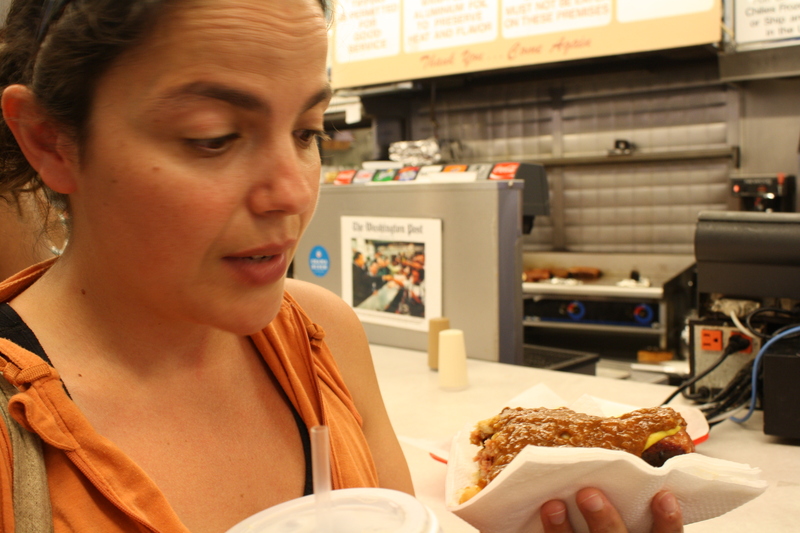 Knowing that I was to be staying just a mere three blocks from Ben’s Chili Bowl in D.C. last week was killing my husband. When I decided to visit some old friends, Mike immediately asked if I was going to eat there. 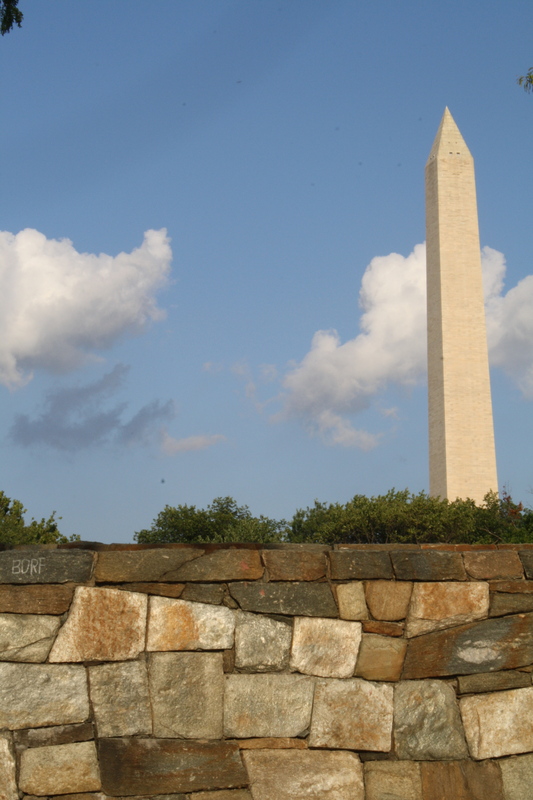 As if this alone were the reason for traveling to our nation’s capital…Museums? The Mall? That giant white house where our president sleeps? Eh. 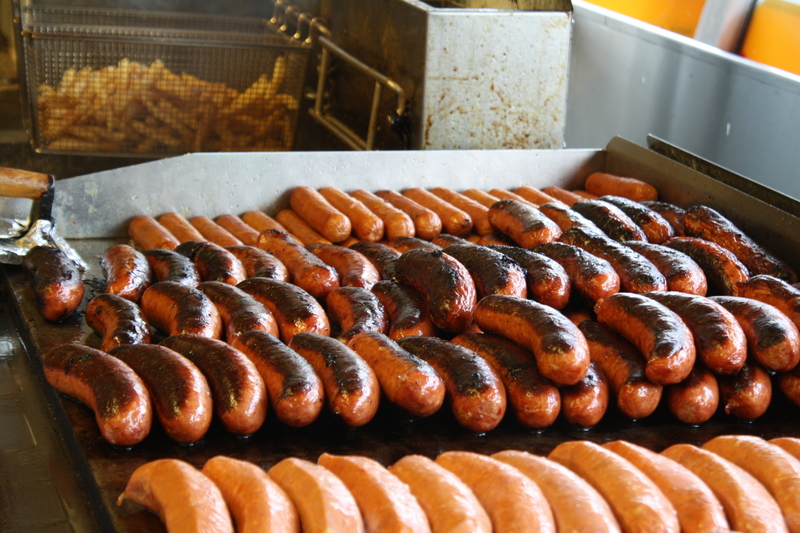 Those things are all great, but what makes a city amazing is, apparently, the hot dogs it has to offer. On a side note, this particular weekend was hot. Not New England hot. Hot like the steam room at your gym hot. Humid and sticky and the weather in which one wants to eat only gazpacho and not, as those of you reading this assume, a hot chili dog. 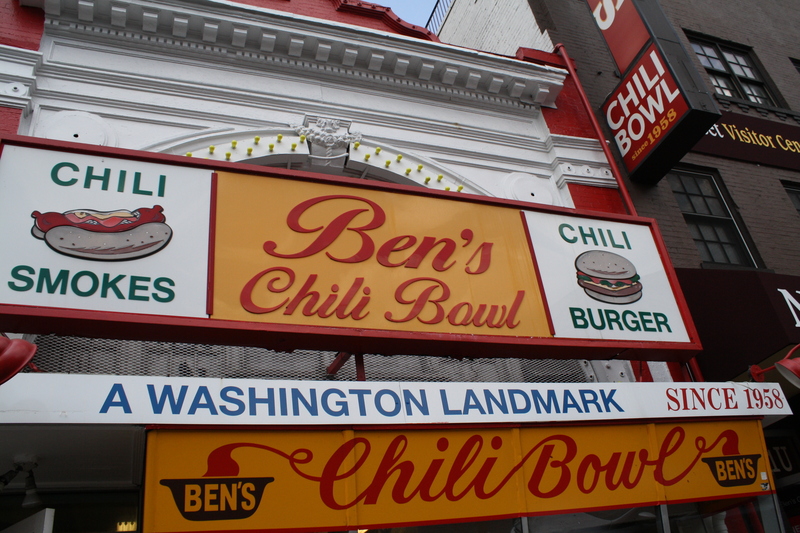 But, alas, I did not want to let down my husband who waited with anticipation each day I was gone to hear word of my experience at Ben’s Chili Bowl. I did manage to get three beautiful ladies to accompany me to the stand. I did not, however, convince any of them to eat any type of hot tube meat. 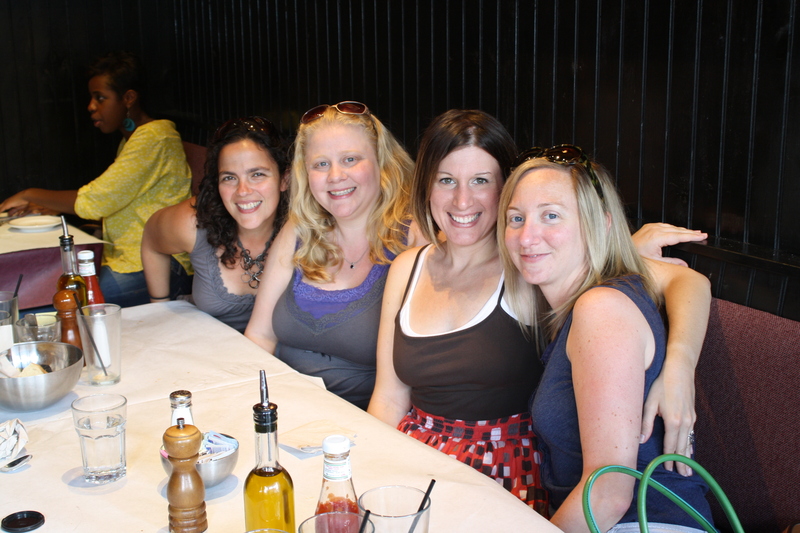 The last time the four of us were together it was 1994 and we were vegetarians spending the summer at a hippy camp protesting the slaughtering of our camp pigs at the end of the season. Oh the ironic nature of life…. So here I am waiting in line for my dog and I remember reading somewhere about how I should order the chili half-smoke, so when it is my turn I blurt out the words “chili half-smoke” and “iced tea” and then I am nervous that I didn’t do it right because I get a little eye from the guy behind the counter. These iconic places have some strange ordering protocols. You don’t want to look like you don’t belong here so you have to know the proper way to order, which I did not. The sweat starts pouring down my forehead as I realize what has happened…the dog comes in a red plastic basket, which I can’t take with me! My friends are all outside melting into the D.C. sidewalk, so I do what anyone would do and wrap it in some napkins and walk out like it was the normal thing to do. My friends managed to snap a few pics while chili dripped all over my face, my shirt, the sidewalk, and my shoes. We walk as I eat. I try to talk to the non-participants about the taste of the onion and mustard as it mixes with the slightly kicked up chili. Talking mostly to myself, I point out how the dog manages to really stand out, as it is extremely juicy and terrifyingly large. 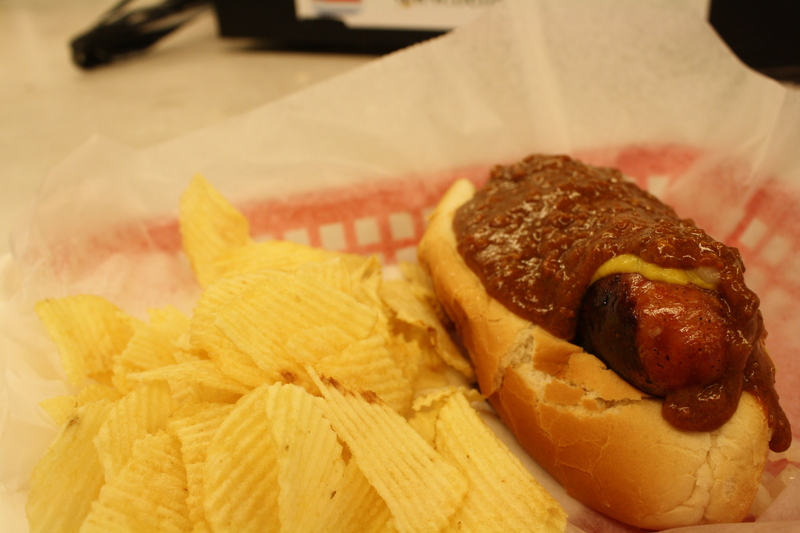 It finds a way through the chili and condiments to truly shine. Judith interrupts my blathering on and tells me it’s not a hot dog. I am confused. All this time I thought I was eating a delicious hot dog, but apparently I am eating something totally different. “It is a half-smoke,” she tells me. It is a half sausage half hot dog concoction that the people at Ben’s have created to confuse and delight its patrons. We go back to Judith’s place and immediately Google half-smoke. According to my friends at Wikipedia, it is similar to a hot dog, but usually larger, spicier, and with more coarsely ground meat, the sausage is often half-pork and half-beef, smoked, and served with a bevy of herbs, onion, and chili sauce. The perfect description, but it missed the yummy part. It was really yummy. I can’t describe all the different things that made it so tasty. Mike is the hot dog connoisseur. I just know what tastes good and what doesn’t. 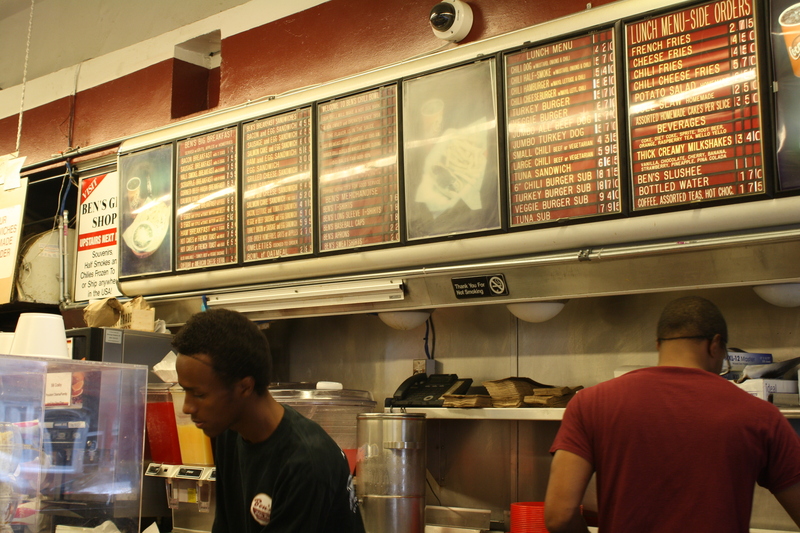 There is a reason Ben’s Chili Bowl has been there since 1958. It is good. You should eat here. The night before I ate soft-shell crab stuffed with crab and washed it down with a bottle of Sauvignon Blanc. That was also good. 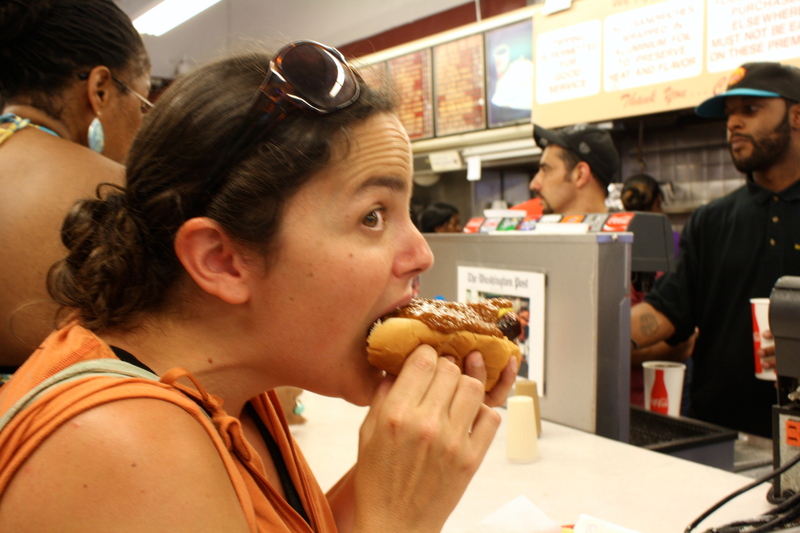 But there is something really awesome about a chili dog (or whatever tubed meat you unexpectedly find on your bun) and a cold sweet tea. ← Attention America: Celebrate July 4th with German, Jewish, and Fireman Dogs! Let me just say: Slobber, slobber, drool, slobber, drool, covet.